Dog Fancy is devoted to the care and enjoyment of all dogs - purebreds and mixed breeds alike. Its goal is to educate, enlighten and entertain its readers, providing them with accessible information they need to be responsible pet owners. Readers Bark Back: Focuses on reader interaction. Newshound: Dogs news, tips and trends. Clean Dog Clean House: Advice from Dog Fancy's cleaning expert. Canine Traveler: Tips on where and how to travel with your pet. Natural Dog: Cutting-edge trends in holistic health care. Best Behavior: Tools to train your pet dog. Checkup: Ask the Vet plus other health news. Haute Dog: Luxury and lifestyle trends for the pampered pooch. Features: Expert advice on the right dog for your lifestyle, training, health and grooming. Recent articles include "Dog Parks: Then and Now," "Achoo, Got Dog Allergies?" Realistic strategies for living in harmony with your pet, and "What Puppies Need." Our editors and contributors are dog lovers just like our readers. Contributing writers include renowned veterinarians, dog trainers and the top dog writers. They are the experts in the field and include September Morn, dog trainer; Karla S. Rugh, DVM, Ph.D.; Eve Adamson, award-winning pet writer; and Kathy Salzberg, NCMG, Certified Master Groomer. Dog Fancy is information driven and provides opportunity for reader interaction. The features are complemented by beautiful four-color photography. Every issue includes a fold-out four-color poster featuring different breeds. Bonus posters are included quarterly with helpful care information. Layouts include sidebars that provide useful information in an easy-to-read and reference format. Dog Fancy is the world's most widely read dog magazine. It speaks to passionate, caring and responsive dog owners. It addition, it reaches more than 40,000 influencers in the canine field. Dog Fancy is engaging, easy-to-digest, clear and concise. It is the comprehensive resources for all things dog. Advertising is relevant to the magazine, offering products and services that dog lovers will be interested in. Advertisers include manufacturers of food and treats, cages and carriers, flea and tick medications, toys and accessories and gifts for dog lovers. Dog Fancy received two Maxwell awards at the 2007 Dog Writers Association of America Awards Banquet. 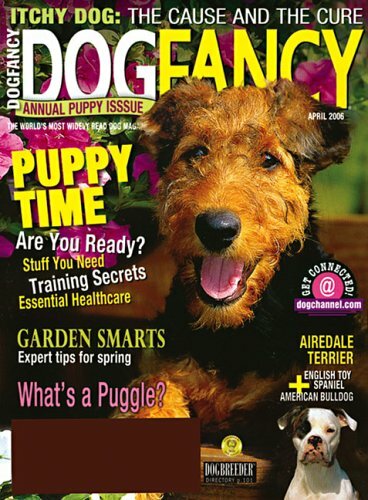 In 2006, Dog Fancy was named the Best All-Breed magazine by the Dog Writers Association of America. Your complete guide to help you better understand, care for and enjoy your dog. Each issue includes cutting-edge medical developments, health and fitness with an emphais on prevention, treatment and natural therapy, behavior and training, travel and activities, breed profiles and dog news, and issues and trends for purebred and mixed-breed dog owners. A Must-Have for Any Dog Owner!!!! Dog Fancy is the magazine for dog lovers! Dog Fancy is the world's most popular dog magazine and it is a publication I have been reading for more than ten years. I first learned of Dog Fancy when I got an offer in the mail to receive a few trial issues free of charge. Since I am a dog owner and confessed dogaholic, I gladly accepted the offer and have been reading Dog Fancy on and off ever since. This magazine has gradually improved over the years and it now stands as one of my favorite magazines. What I like most about Dog Fancy is the fact that it makes every effort to cover something of interest to any dog owner- casual or serious- in every single issue. This is one of the reasons why Dog Fancy contains so many monthly departments. It has more departments than most other magazines and while the number might seem excessive at first, it is nice that so many different topics are covered. No matter what you want to learn, discover, or discuss about dogs, you can find something related to your interest in every issue. Dog Fancy offers advice on dog care, tips on behavior modification, coverage of dog shows, and profiles of different breeds. Each issue of Dog Fancy features a photo of a specific breed on the cover with a full article on the inside that discusses the breed, its personality, and its characteristics. In addition to the dog on the cover, there are other breed profiles, too, and in the center of each issue is a colorful pull- out poster of the featured breeds. Kids, in particular, love this pull- out and many will want to grab it and place it on the refrigerator or on their bedroom wall. Dog Fancy has lots of departments and features and one way the magazine helps readers find articles of interest is through its "On the Cover" diagram. This helpful feature shows a small snapshot of the cover along with arrows pointing to each article mentioned on the cover and the page to turn to find the article. This is very helpful. I cannot count the number of magazines I have read that include a teaser message on the front cover that piques my interest but then buries the related article somewhere inside. Dog Fancy has eliminated that problem once and for all with this very helpful diagram. If it's on the cover and you want to read about it, you can find the article in a matter of seconds. Another way that Dog Fancy is very helpful is with its classified ads. Now, I admit that I don't usually look at classified ads in magazines and I rarely endorse them. But Dog Fancy has one unique classified feature: Its Dog Breeder Directory. Here, a person can lookup a breed and then quickly get in touch with a breeder. Finding a puppy is easy if you're looking for a common breed like a Golden Retriever, Poodle, Labrador Retriever, or Cocker Spaniel. But what if you want a rare breed like a Catalan Sheepdog, Sloughi, or Beauceron? These dogs and others like them are so rare it may be impossible to find one in your area. But Dog Fancy's Dog Breeder Directory helps link breeders with buyers, letting potential owners know who to contact to find the desired breed. Dog Fancy is an informative, helpful magazine that makes a great choice of reading material for dog owners of all stripes. Whether you're a dog breeder, a dog show enthusiast, or just a casual dog owner you will find something of value in Dog Fancy. It is my favorite dog magazine and its one I recommend to anyone with even the slightest interest in the subject of canines. If you have a dog, or know of a real dog lover, I'd consider getting this as a gift for yourself or them. This magazine can be kitschy at times, but for the most part, it imparts some very useful information. This is especially true of new advances in dog medicine, products to avoid, etc. Dog Fancy is great ! Have received 2 copies so far and the magazine is fine...seems a bit more geared to puppy owners and my dog is 1yr 4mos now. Will reserve final judgment on it after more copies come my way.